I hope I'm not judged too much for this, but I only just saw the original Ghostbusters (1984) a few weeks ago. I couldn't remember if I had seen it once, a long time ago, or not at all, so I rented it on Google Play (only $1.50 during a half-off sale! ), and watched it. I found the first one to be campy but fun - a movie I might not watch over and over again, but one I enjoyed while watching it. The newest incarnation of Ghostbusters has been updated with modern special effects, and I actually enjoyed it more than the original. Erin Gilbert (Kristen Wiig) is a professor at Columbia (NYC) and is up for tenure. A local resident comes to see her about an old book she published on the paranormal, asking her to investigate a historical mansion nearby that may be haunted. Erin wasn't even aware the book was on Amazon for sale, so she goes to find Abby (Melissa McCarthy), her co-author and former friend, to ask about it. Abby and her new partner, Jillian (Kate McKinnon), are still investigating ghosts, and they're super excited to learn of the possibility of a haunting at the mansion. They drag Erin over to the mansion and indeed find that it's haunted; from there, things start to spiral quickly, and soon the three of them plus a new Ghostbuster member, Patty (Leslie Jones), must save the city from being infected by ghosts. What I really liked about this installment was that it has definitely received a 2016 upgrade, but most of the cast members from the original made cameos here too - Bill Murray, Sigourney Weaver, Dan Aykroyd, and more have bit parts throughout. Make sure you stay ALL the way through the credits too, for an additional end scene, which fans of the original movie will appreciate too; there's a nod to the first movie in that scene as well. 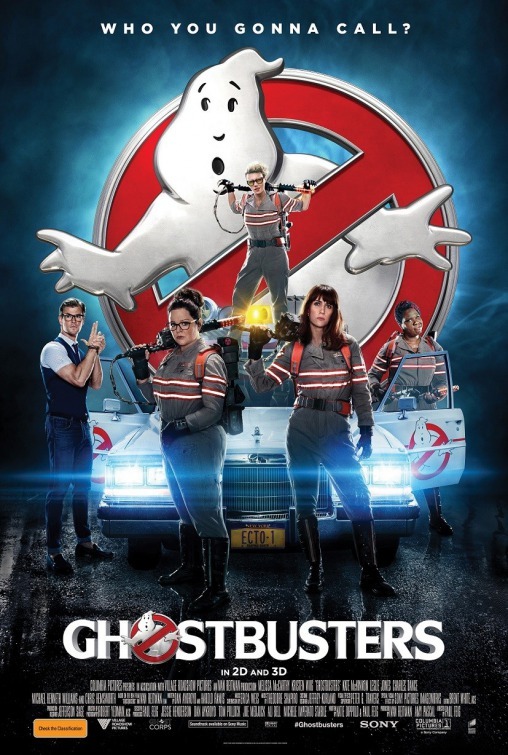 The all-women cast worked well here, too, although surprisingly my favorite of the Ghostbusters was Jillian (Kate McKinnon); Wiig, McCarthy, and Jones were good here too, with McCarthy playing a toned down version of the usual characters she plays (same for Wiig, actually). Yes, see this movie, and see it in 3D - I rarely say you must see a film in 3D, for live-action movies, but this one made very good use of it. I believe that a lot of people who are major fans of the old movie have been giving this one bad reviews, simply because the old one is so nostalgic, but it was one of the more fun films I've seen in the theaters so far this summer; it's definitely a "popcorn film," but it's one I would see again in theaters, if I had time, or on Blu-ray/DVD later. Fans of the older film will most likely be divisive on if they enjoy this version better or not, but I found it to be much updated and improved over the first movie, and it should draw a crowd of both new fans and fans who want to compare the two films. Ghostbusters is in theaters today, June 15th, and is rated PG-13 with a runtime of 116 minutes. 4 stars out of 5.